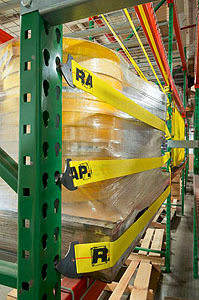 Rack Safety Straps: Straps are 2" wide and easily connect to teardrop style pallet rack uprights to provide load stops at the back of the rack bay to protect workers from falling items and to maintain flue space for fire prevention. Rack Safety Straps with Fixed Mesh Panel: Reinforced mesh panel safety straps are 32.5" wide to provide more coverage for items that may fall through the gaps of regular rack safety straps. Rack Safety Straps with Sliding Mesh Panel: Rack safety straps with sliding mesh panels are ideal for use on the front side of pallet bays to help increase safety in picking situations. End of Aisle Rack Safety Straps End of aisle rack safety straps prevent items from being pushed or falling of the end of a rack bay into a work space or traffic lane.